If you are trying to save some money but need to redecorate your living space consider painting your furniture black. Black paint gives the room a contemporary feel and black is very versatile. It can fit almost any decorate scheme. Your furniture with still retains the same dependable functionality that fit your needs before. Add a touch of flare to your old furniture by painting it black. A misconception about painting furniture black is that it may be difficult. On the contrary, preparing your furniture to be painted black may be easier than painting your furniture a lighter color. Remove all hardware, knobs and handles from the furniture prior to painting it. Use a screwdriver or drill to remove these pieces. Also, remove any drawers that can be take out. Clean the furniture prior to painting it. Use a solution made of dish washing liquid and water. You can use trisodium phosphate for heavier cleaning needs. Be sure to use protective rubber gloves and eye protection goggles when using trisodium phosphate. Use 120 grit sandpaper to fix up chips, scratches and any area that needs to be smoothed. Wipe the sanded areas with a tack cloth to remove all residue from the sanding process. Lay a drop cloth across your floor to protect it from accidental paint spills. Follow the directions on the paint can. Open your black paint, stir the paint with a wooden stir stick and dip your paintbrush into the paint. Test the paint on a hidden part of the furniture to see how it bonds. 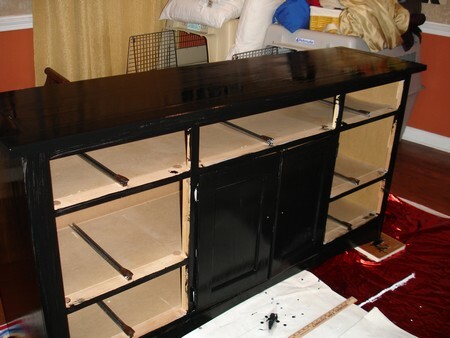 Check to see if the black paint bonded to the furniture you want to paint. If the paint got absorbed into the furniture, or the paint is missing, you will need to prime the surface of the furniture to help the paint adhere to the furniture. Apply primer spray to the furniture in an even layer from left to right. Apply the black paint to the furniture. Begin at the inside corners of the furniture and move to the outside. Paint the flat surface with with a small brush or roller. Allow the first coat to dry before moving on. If the first coat isn’t thick enough, apply a second coat of black paint.